A video shows disturbing images of a starving polar bear, and the conservation group that filmed it believes climate change may be to blame. In the clip, the emaciated animal, bones visible through its yellowing fur, struggles to walk as it searches for food in an abandoned fishing camp. The July video was captured by SeaLegacy filmmakers on Somerset Island, near Baffin Island in Nunavut, where they were shooting a documentary about the effects of climate change. "When the animal first got up and we could see that he was actually in the late stages of starvation. It was incredibly shocking," SeaLegacy co-founder Cristina Mittermeier told As It Happens guest host Jim Brown. She said she suspects the animal's condition is linked to climate change, but says she can't be certain. "It is impossible to tell why he was in this state. Maybe it could've been because of an injury or disease," Mittermeier said. In the video, the bear makes its way to a trash bin and pulls out its meal. "It looked like a piece of the seat from a snowmobile," she said. "That's what it was eating — this foam that was burned and charred and absolutely not edible." The scene was emotional for the photographers and crew. "All of our team was in tears and feeling completely helpless to do anything about it except to roll our cameras and share it with the world." Polar bears rely on sea ice to access their main food sources: seal and walrus. In many parts of the Arctic, where the SeaLegacy team filmed for several weeks, the mammals are thriving. 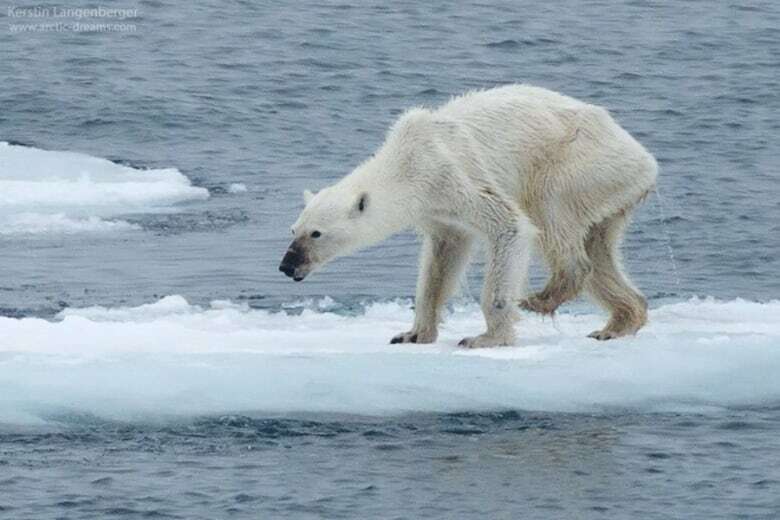 But in this part of the Arctic, winters are shrinking, causing sea ice to melt before the bears can gather enough food to last them through hibernation. "We hear from scientists that in the next 100 to 150 years, we're going to lose polar bears," Mittermeier said. "We wanted the world to see what starvation of a majestic animal like this looks like." The video left many worried. Some wondered why the crew and photographers didn't intervene. Mittermeier said that while the scene was difficult for her and her team to witness, there was nothing they could do. "People need to understand that polar bears can eat several hundreds of pounds of seal meat in a matter of days," Mittermeier said. Paul Nicklen, SeaLegacy co-founder and photographer, told National Geographic: "It's not like I walk around with a tranquilizer gun or 400 pounds of seal meat." Even if they had enough food to feed the animal, it's not only dangerous, but illegal to approach a polar bear in the wild. Mittermeier said she also believes that the bear had only days left to live, so any action would have prolonged its suffering. Though it's possible that climate change is responsible for the bear's sickly appearance, some caution that it may be premature to jump to that conclusion based on a video. A similar photo surfaced on social media in 2015. 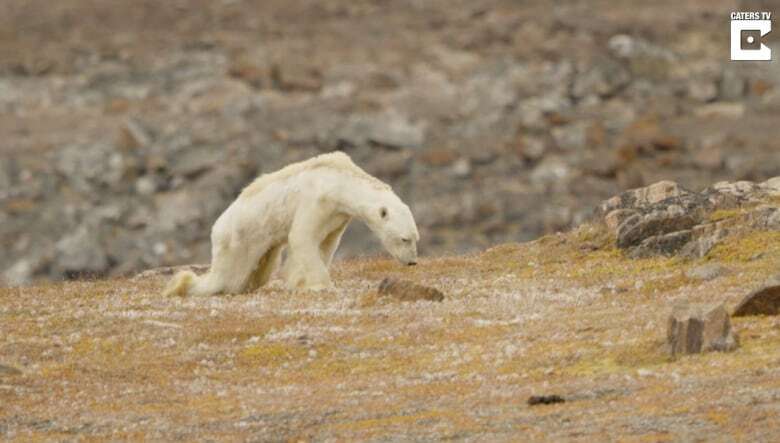 German Arctic nature guide Kerstin Langenberger posted a widely shared Facebook post of a similarly emaciated bear, this one on a floe. "A mere skeleton, hurt on her front leg, possibly by a desperate attempt to hunt a walrus while she was stuck on land," Langenberger wrote. She continued, arguing that human-made climate change led the bear to starve. But Ian Stirling from the University of Alberta told the U.K.'s Metro News that a bear like this could be sick or simply old. "A difficulty hunting could be involved. I don't think you can tie that one to starvation because of lack of sea ice," he continued. While Mittermeier said the bear had no obvious injuries and she believes it was too young to die of old age, she contends that's irrelevant. "The point is that it was starving, and ... as we lose sea ice in the Arctic, polar bears will starve." According to recent research by biologist Nick Lunn, polar bear populations in northern Manitoba are down by a third since the 1980s. They're also spending, on average, 30 days longer per year on land. "That is cause for concern, but it's also a warning bell," he told CBC News last month. He believes that polar bears could disappear from that area in 20 to 40 years unless the planet cools. That's why Mittermeier hopes that this video will spark a broader conversation around conservation efforts. "There are solutions in place to slow down the emissions of fossil fuels and draw down carbon from the atmosphere," she says. "There's things that are already in place that we can all be participating in and demanding that our governments do on our behalf."